Introduction - Bonnie wanted to celebrate our 50th wedding anniversary by returning to Siena (a small town in Italy’s Tuscany in which we lived for a year after we retired) to see our Sienese friends. Thinking that was a neat idea I put in the itinerary Palermo and landed/took off from Rome. We had been to the eastern side of Sicily previously and since then I wanted to see Palermo. Additionally, there were a couple of shots I wanted to get in Rome. The last one is what I wanted. San Francisco- Bonnie and I drove to San Francisco airport the day before our flight. 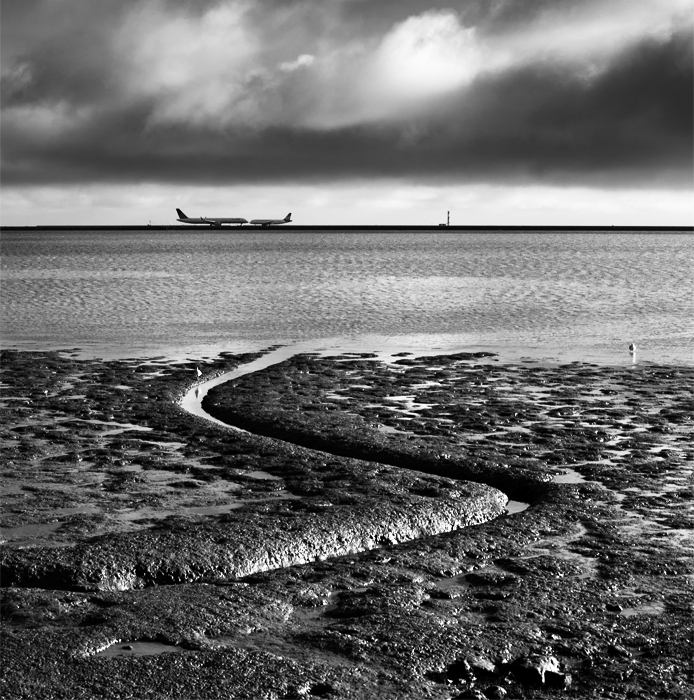 Waiting to catch a ride to the San Francisco Airport I saw what looked like a little conflict on a dreary morning. I hoped it didn’t foretell the trip’s future. Unfortunately it did, for part of the trip anyway. Piazza Venezia - Rome a city of contrast, modern, old, older, and really older. This photo captures the modern throngs of tourists and cars in front of (old) the monument to Vittorio Emanuele II (left side, the first king of unified Italy and also known as the “Wedding Cake” or the “Typewriter”) in Piazza Venezia, the various (older) 16th-18th century church cupolas, and in the foreground the really older Trajan’s Forum and Column (112-113AD). Trajan’s Market - Keep your eye open for things other than Roman ruins. 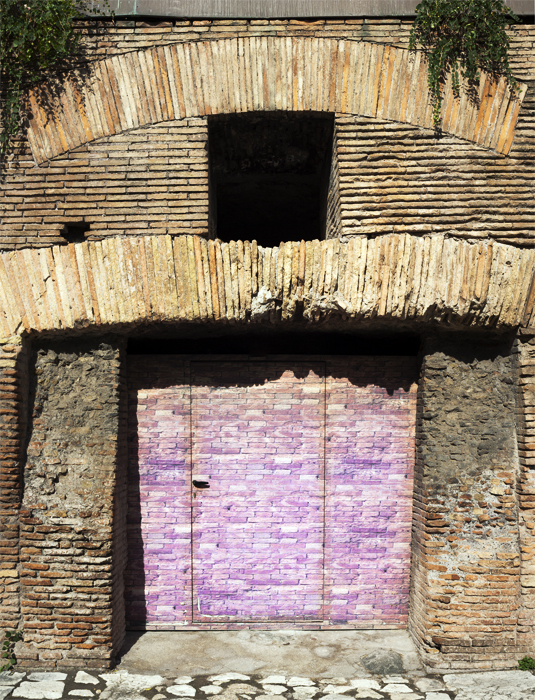 This is apparently a modern up-grade of a doorway in Trajan’s Market. Excavation - This photo seems to me indicates the depth of excavations done to uncover Roman history. 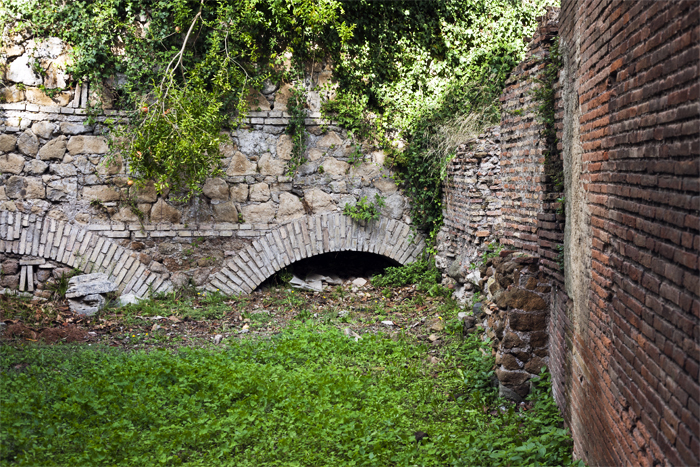 Four or 5 more levels of excavations remain to uncover the history of Rome. Straight Of Massina - After a few days it was off to Palermo (with friends Cindy and Ken). First a 7 hour train ride to Reggio-Calabria at the toe of Italy. 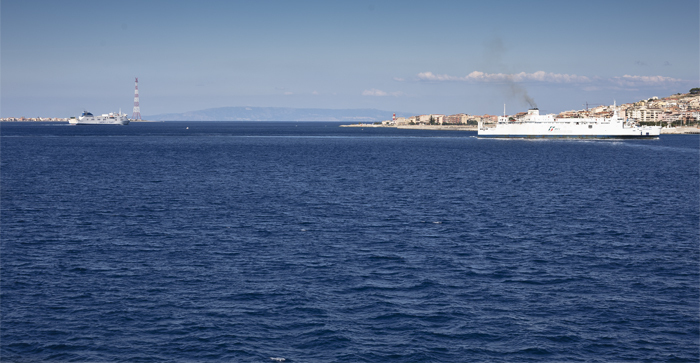 The train, with us in it, was loaded onto a ferry for the 2 hours to Palermo. Safely aboard and believe it or not, still afloat, I was on deck with a good cappuccino from the cafeteria and a good view of the Straight of Messina separating Sicily from the “Boot”. This is an area Hannibal would have passed through after his 20+ years running around Italy thumping the hell out of Romans. 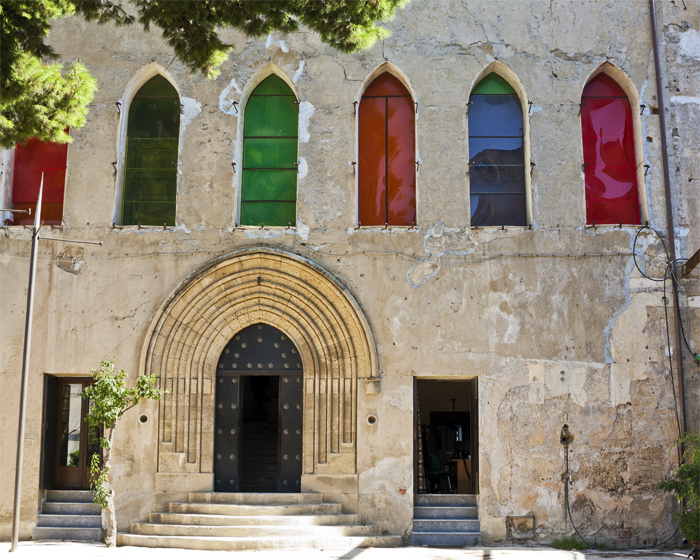 Palermo - Sicily has a different history than Rome leading to different foods and architecture. The eastern side was founded by the Greeks in the 600s BC whereas the southwestern side was founded by Phoenicians and Carthaginians then invaded and ruled by Romans, Arabs (this shows their architectural influence), Normans and every hoard in between. This picture is of the Palazzo Forcella de Seta from the oldest part of the city, the Kalsa district. It demonstrates the Arab influence on the architecture. In other parts of the city you might think you are on a street in Paris. The Hotel - I have to give a plug for the place we stayed in Palermo and our favorite restaurant. Hotel Serena was centrally located, clean, and comfortable with great staff. Massimo, our night clerk, with me accepting a wake-up cappuccino he had just prepared, spoke great English and has an interest in Palermo’s and Sicily’s history and is a great source of information. As you can guess from the photo, you can have a morning/evening night-cap. 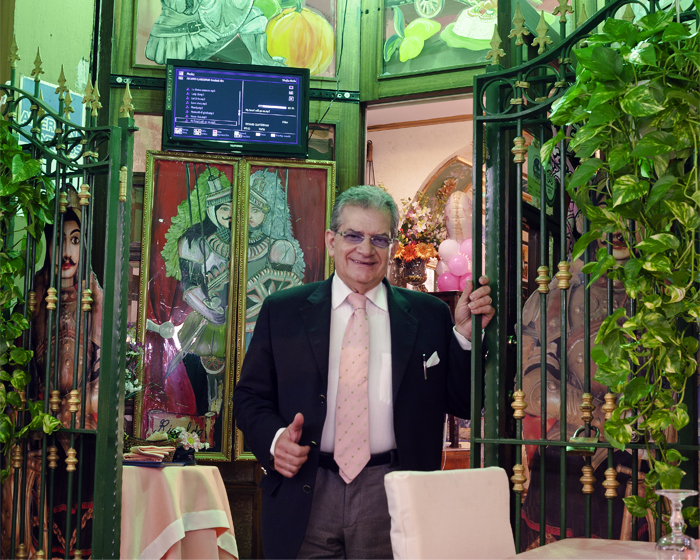 “THE” Restaurant - Massimo suggested eating at Al Cancelletto Verde (“At the Little Green Gate”). We kept returning to it because it was so good and reasonably priced. This photo is of the owner (Angello) at the entrance. 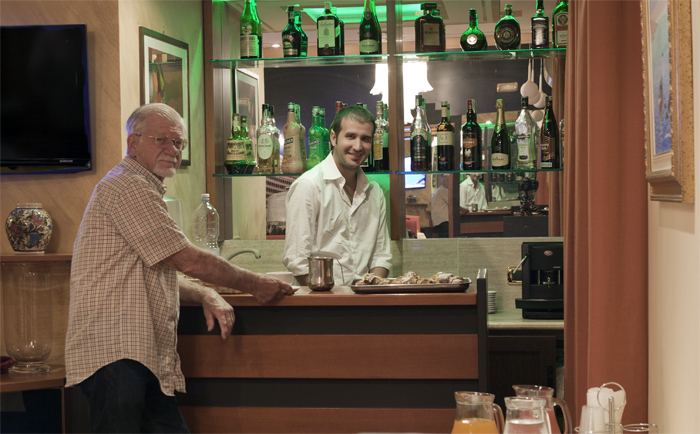 He was a great host offering (and of course us accepting) a sweet after dinner drink similar to Tuscany’s Vin Santo. Note the figures behind the gate. They are paintings of Sicilian marionettes. If you eat outside like we did make sure you go inside to see the fantastic decorations and frescos based on the marionette theme. 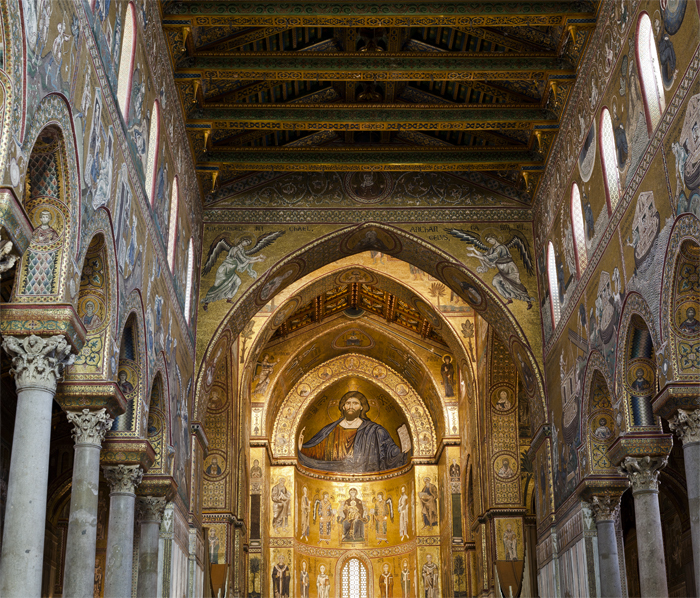 The Abbey - Monreale (“royal mountain”) is a small mountain town some 15 kilometers from Palermo. The reputed fantastic church mosaics. Massimo warned me about the random changes in bus schedules. Boy was he correct. After a 20 minute bus ride from the city center to the bottom of the hill below Monreale we and maybe 20 other people were dropped off to catch another bus for the remaining 4 km. We were standing in the sun 20+ minutes with no bus in site and enduring Ken’s grousing, blaming me for his discomfort, and poor guiding abilities. A taxi drove by and Cindy, being swift as a cheetah on prey, grabbed it and up the hill we went. The first photo of the arches of the abbey. The Cathedral –The guide books stress the cathedral and they are correct. This is a picture of the cathedral’s interior – and it’s all little pieces of glass. Going there was well worth the trouble. 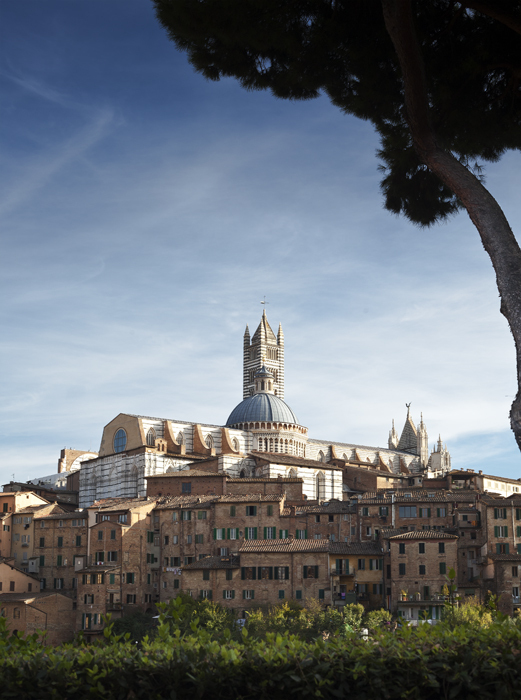 Siena - Unfortunately, I caught a bug in Palermo which made the next part of the trip uncomfortable to say the least. But Bonnie and I did get to Siena to see friends we made when we lived there some 10 years ago. Siena is a walled (the oldest part constructed abound 1000AD) hill-town in Tuscany established by the Etruscans in the pre-Roman era and one of the most visited in Italy (so it is claimed). 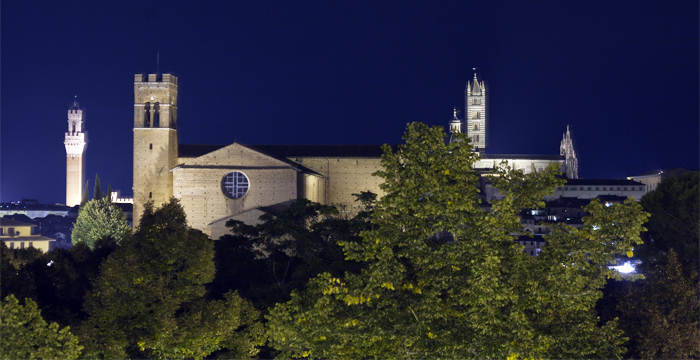 This is a night picture that captures the three more significant tourist attractions in Siena, Il Torre di Mangia, San Dominico (a Dominican church), and Il Duomo. Il Duomo - This is a daytime view of the most beautiful cathedrals of Italy but like any Senese i'm biased so go see for yourself. 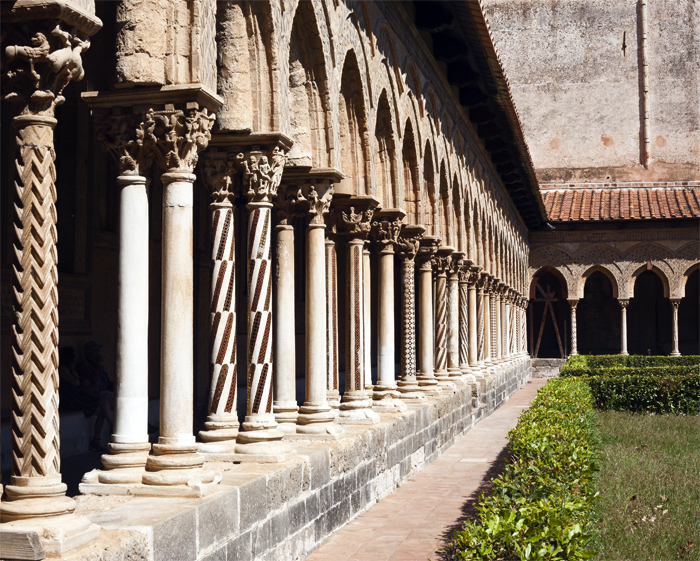 It was constructed of black and white marbel from 1338-1348 with some odd-and-ends added some time later. The floors have fantastic marbel mosaics that, when we lived there, were covered most of the year with uncovering several times a year. Unlike now you didn't have to pay to get in. 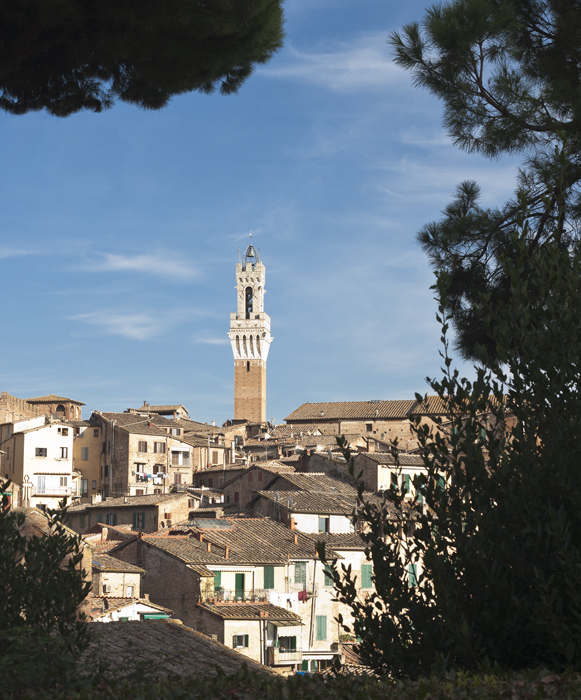 Il Torre del Mangia - This tower is a main focus of the Piazza del Campo, a scalop shaped piazza at the center of the city. It is 289 ft tall (I don't know if that includes the spire) in which you can get to the top (of course for a price) and have a fantastic view of the city and countryside. If you go, note the holes symetrically placed up the tower. They are holes left from the scaffolding (or so says a Sienese friend says). 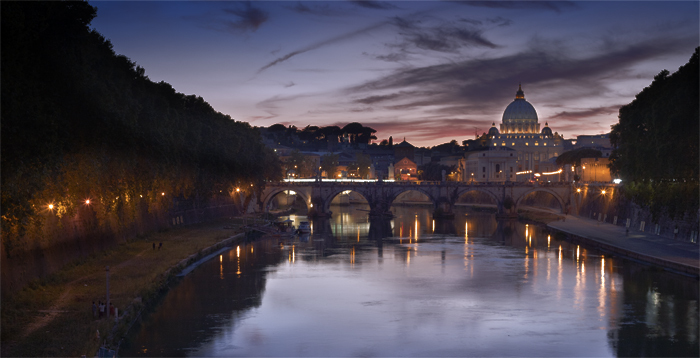 Saint Peter's and the Fiume Tevere - "Fiume" is river in itlaian but how did some Englishman get "Tiber" out of "Tevere" (and like "Florence" out of "Firenze")? This is a view (a couple of blocks down from our favorite restaurant that I have been trying to capture (with a beatuful sky to match the scene) every time I go to Rome and from a spot everybody and their dog shoots. I guess I can quit now.